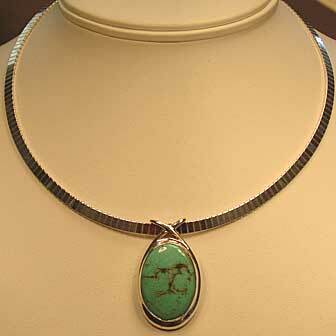 Genuine turquoise is enjoying a well-deserved comeback in styles that are wearable with both dress and casual clothing. 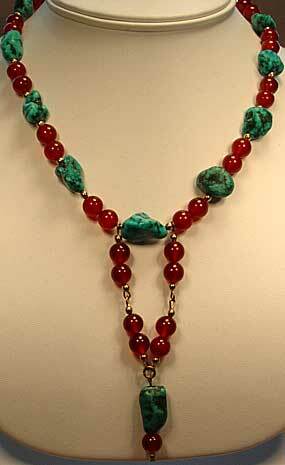 All items on this page are genuine turquoise from both domestic and foreign sources. Color variance within pieces is normal and to be expected with natural substances. 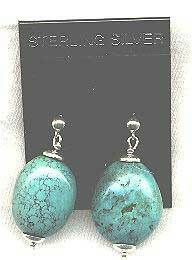 Description: Turquoise Sterling Earrings - These nugget earrings have been polished into a oblong sphere measuring 3/4" x 7/8" x 1/2, and dangle from sterling silver findings. Substantial feeling but not heavy enough to cause discomfort. For pierced ears. Description: Turquoise Rondelle Pendant Necklace - Pendant portion of this necklace is very much like the above earrings, and measures 5/8" x 5/8" x 3/8". 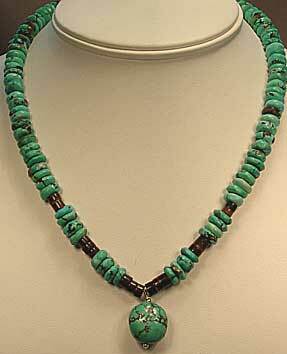 "Chain" portion of necklace is made up of 3mm deep by 8mm in diameter turquoise rondelle beads accented near the pendant with smaller brownish-black rondelles of unknown material which appears to be natural, not man-made. Adjustable sterling findings will accommodate up to an 18" neck, and could be further extended if necessary.